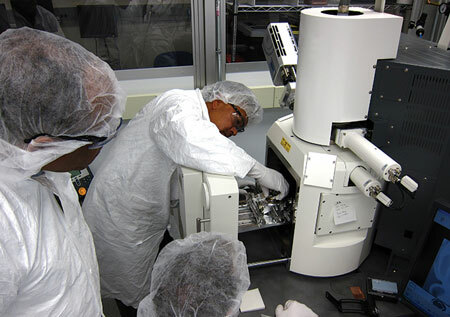 (Nanowerk News) ASTM International recently published two standards that will educate existing and future workers in nanotechnology. Educators will use the new standards to develop and refine curricula at the undergraduate level. At the same time, industries and businesses may use the standards as a basis for hiring new graduates as well as for upgrading skills of current employees. Students being trained to use a scanning electron microscope. The Nanotechnology Applications and Career Knowledge Network initiated the development of the new standards (E2996, Guide for Workforce Education in Nanotechnology Health and Safety, and E3001, Practice for Workforce Education in Nanotechnology Characterization). NACK’s mission is to help create and sustain economically viable nanotechnology education at community and four-year colleges and at universities. NACK is helping to develop a series of nanotechnology education standards through ASTM International’s Committee E56 on Nanotechnology. Two key NACK Network stakeholders are Pennsylvania State University, which is the home of the NACK Network, and the National Science Foundation’s Advanced Technological Education Program, which is the government organization that funds the NACK Network. “The goal is to define a set of foundational standards for nanotechnology workforce education at the undergraduate level. This will promote uniformity in the qualifications of graduates to meet both industry and academic needs,” says ASTM member Raymond Tsui, Ph.D., a faculty associate in the School of Electrical, Computer and Energy Engineering at Arizona State University, a partner in the NACK Network. E2996 provides a basic educational structure in the health and safety aspects of nanotechnology, describing the minimum knowledge base needed for an individual involved in nanomanufacturing or nanomaterials research. E2996 was developed through Subcommittee E56.03 on Environment, Health and Safety. E3001 establishes the basic structure for education in the characterization of nanoscale materials at the undergraduate level. E3001 was created through Subcommittee E56.02 on Physical and Chemical Characterization. Both standards are now under the jurisdiction of a new subcommittee, E56.07 on Education and Workforce Development. These two standards are flexible enough to be tailored to regional industry needs while retaining a high degree of equivalency in educational depth and breadth across geographical boundaries. With support from the NACK Network, E56.07 plans to develop additional education standards as well as an overarching standard that unites them. All interested parties are encouraged to join in the work of this new subcommittee.